This GRISM, designed and realized by the gOlem group, (Gruppo di Ottiche e Lenti Merate, INAF- Osservatorio Astronomico di Brera ) , is a special dispersing element, that can provide, in a single exposure, a low resolution spectrum in the range 0.36 - 1.0 micron. This GRISM is a compromise solution for those scientists interested in low resolution spectroscopy of the whole visible range but mostly interested in the red part of the spectrum. The performance of the instrument will be updated continuously, also on the basis of the feedback from the users. Please address specific questions or comments to grisu-help-desk. The GRISM behaves as a sort of echellette, so on the detector two spectra appears, one related to the first order of diffraction (red part of the spectrum) and the second one to the second order of diffraction (blue part of the spectrum). 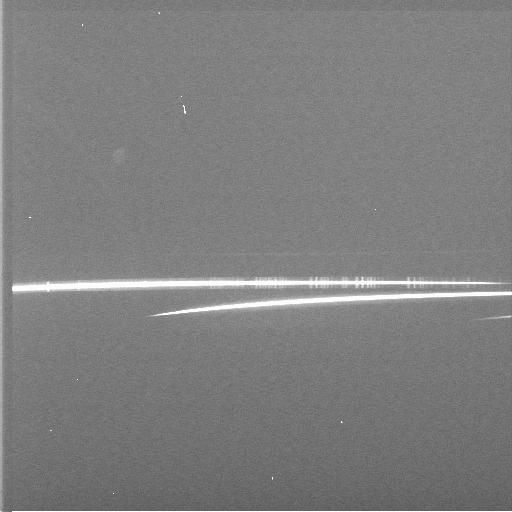 Due to the GRISM structure, the spectra do not appear centred with the object on the detector. Their position is shifted by design. The specifications of the GRISM are reported in the following table 1. The spectra image layout is shown in Figure 1. On on the top is visible the 1st order and beneath this is visible the 2nd orders. Figure 1. The image layout: the upper spectrum is the 1st order (red part of the spectrum) and the lower spectrum is the 2nd order (blue part of the spectrum). The image layout is obtained via a cross-dispersing prism that separates the otherwise superimposed 1st and 2nd orders. The price to pay is that only short slits can be used. We are using a rectangular hole, superimposed on the standard DOLORES long slits, that reduce the long slit to a 12" short slit. The resulting spectra are separated by almost 12". Due to the man work necessary to mount the mask on the required slit, at the moment, this GRISM must be asked in due time and will not be available for short time response observations. The GRISM efficiency of this Grism is showed in Fig 2. The red part of the spectrum has an efficiency comparable with the LRR DOLORES GRISM (see Fig. 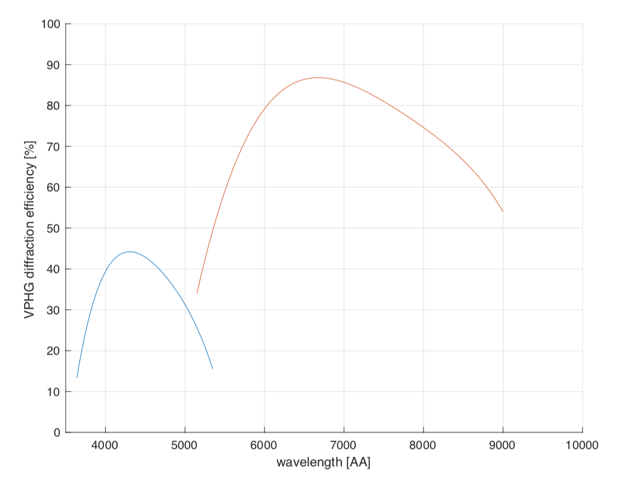 3) but without the second order contamination in the most red part of the spectrum. The blue channel has an efficiency of about 42 % of the LRB DOLORES GRISM (See Fig 3). Figure 2. Efficiency of the grism GRIS-U. Figure 3. 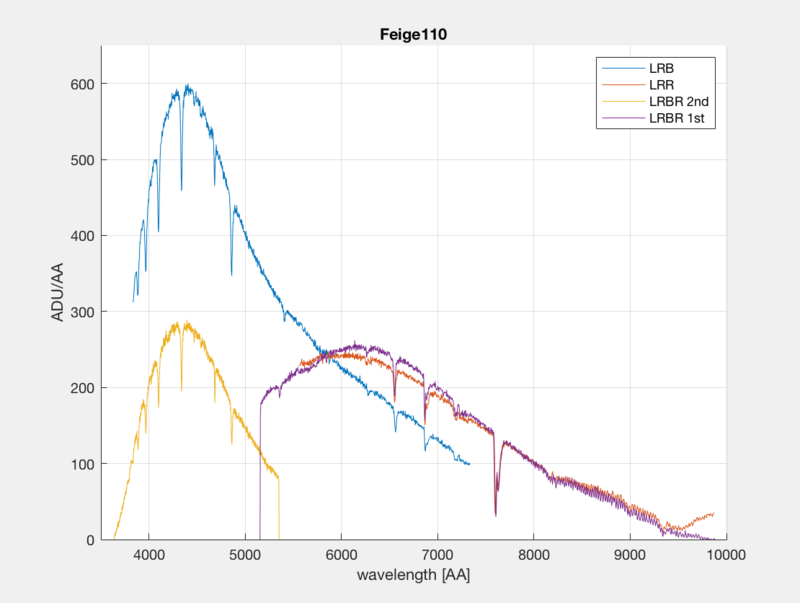 Comparison between spectra of star Feige110 obtained with LRR DOLORES GRISM (in red), LRB DOLORES GRISM (in blue) and GRIS-U (1st order in purple and 2nd order in yellow). The new grism GRIS-U is not implemented yet in the Exposure Time Calculator. Taking in account the efficiency of LRR, LRB and GRIS-U, we suggest to use outputs of the Exposure Time Calculator obtained for LRR for the 1st order spectrum, and outputs obtained for LRB, increasing the exposure time by 2.4, for the second order spectrum. For any comments please contact Luca Di Fabrizio.